#GivingTuesday is a global day of giving, celebrated on the Tuesday after Thanksgiving, to empower everyday people to help the organizations they care about and make their world a better place, one donation at a time. 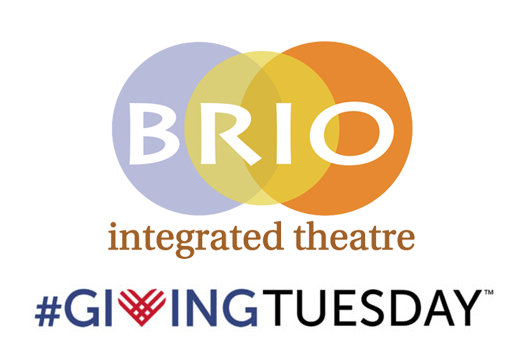 You can be part of this international phenomenon by supporting Brio Integrated Theatre. Your donation, in any amount, will help us continue our internship programs with EMARC and NuPath where we help them learn real life skills in a creative way. Our high school students and older internships work on creative projects that they are passionate about and where they learn new skills and new successes. At the same time, your support will also help Brio bring other programs next year to our community at large, like creative community workshops with guest artists, and our evening ASL beginners and intermediate classes. We will be posting each week #myBrioStories where you can hear from our interns and learn about the projects they are working on, also meet our wonderful staff, teachers and guest artists. Please consider making a donation, and help spread the word that donations in any amount will help us making the Arts available for All abilities!